Pope Francis spent two days in the United Arab Emirates (UAE) last week. The journey was historic, as this was the first papal visit to the Arabian Peninsula. The visit needed to be recorded in all possible ways. 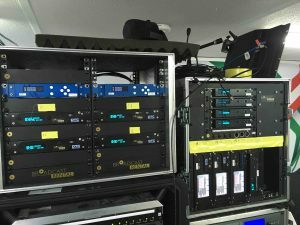 For the live broadcasts on 4 and 5 February, Broadcast Rental supplied 13 DTC OBTX & AEON transmitters, 13 DTC PRORXD receivers, eight Videosys fibresystems, supplemented with four Videosys telemetry systems. The company also decided to bring along a DTC Nanovue receiver for in-field engineering to be able to monitor the wireless systems anywhere required. 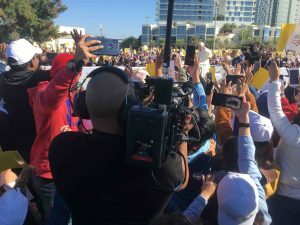 On Monday 4 February there was a live broadcast from The Founders Memorial, where the Pope held the International Interfaith Meeting — the primary reason for his visit to the UAE. For this Interreligious mission Broadcast Rental provided five DTC RF Systems in combination with Sony F55s and telemetry from Videosys. Then, on the morning of Tuesday 5 February, the first public Mass ever in UAE was celebrated in Zayed City. The papal Mass was the most anticipated event for the Pope’s visit to the UAE (home to one million Catholics), in order for the faithful to catch a glimpse of the bishop of Rome. The Pope travelled along a two kilometre route that ended at the Zayed Sports City Stadium. Of the eight wireless cameras used during the live broadcast, seven were deployed along this 2 km parade. Three were roof-mounted along the route — all Sony 4300s with big lenses — with the other three being handheld Sony F55s. There was not much time for rigging, as the final of the Asian Cup (Qatar vs Japan, resulting in a shock win for Qatar) was held on Friday 1 February — also at the Zayed Sports City Stadium. It is estimated that 135,000 people attended the papal Mass on Tuesday. “One of the biggest challenges at an event of this size is that when you use 15 wireless cameras at the same time, you also require 15 different frequencies,” Broadcast Rental founder and CEO GP Slee told SVG Europe.